A new online petition asks the White House to repeal budget cuts that have spurred NASA to suspend many of its education and public-outreach efforts. 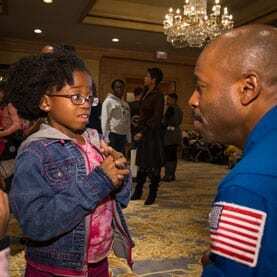 The petition was created on Friday (March 22), the same day that NASA issued two internal memos outlining how outreach activities are being scaled back as a result ofsequestration, the set of across-the-board federal cuts that took effect March 1. The memos began circulating outside the agency Friday as well. The petition was submitted through the White House’s official “We the People” site, which promises an administration response to any petition that garners at least 100,000 signatures within 30 days. As of today (March 27), the NASA education petition has gotten about 5,800 people to sign on. Some organizations are already taking steps to help fill the education and public outreach (EPO) gap that NASA’s suspension has created. Space-funding company Uwingu, for example, announced Monday (March 25) that money raised by its public contest to name Alpha Centauri Bb — the closest known exoplanet to our own solar system — will be put toward grants for EPO projects and personnel affected by NASA’s cutback. “At Uwingu, we believe that private and commercial funding of space-based initiatives — including research and EPO — is more important now than ever,” company CEO Alan Stern, a former NASA science chief and head of the agency’s New Horizons mission to Pluto, said in a statement.